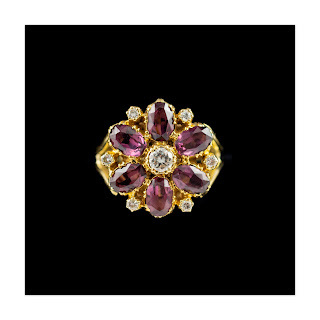 We are happy to share this new listing today presenting a splendid rhodolite garnet and diamond daisy ring made in 18ct gold. Just take a look at the colour of those rich translucent garnets and how they are complimented by the sparkling white diamonds. Here at Helenas Curio we loce antique and vintgae lockets of all shapes and sizes and this vintage silver locket pendant was quite a lovely find. 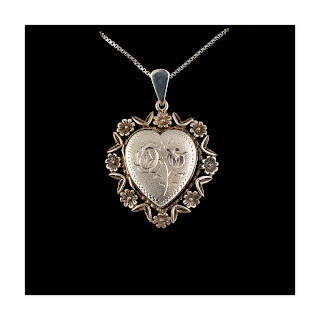 The heart shape picture locket displays a wonderful floral design and is set into a decorative mount with further flower and leaves. The piece comes with light weight silver box chain. To view this and more delightful antique and vintage jewellery items please visit our Etsy store today. We have a super selection of antique lavalieres in our Etsy store. We are delighted to have found this stunning example. 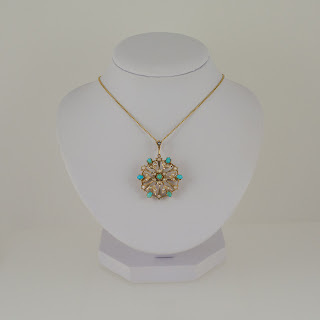 The Victorian lavailere features gold flower shape settings set with turquoise and pearls. The piece can be worn as a brooch or a pendant so its a two in one how cool is that!